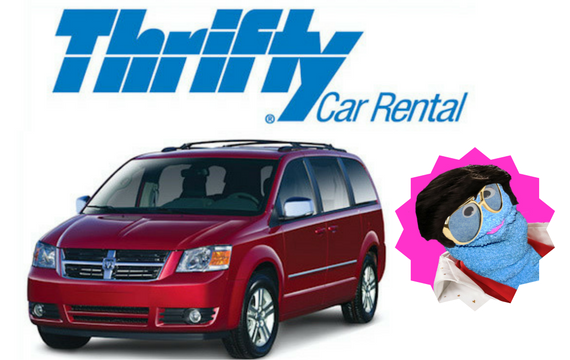 Use our Thrifty promotional code for 10% off weekend rentals at Thrifty Car Rental Las Vegas. This is good for any size car, everything from compact to SUV to convertible. When we tested the code, prices started at just $14.25 per day! Just click on Coupon Puppet below to get this deal. The promotional code should autopopulate on the Thrifty site, but just in case, it’s 101175. When you arrive at McCarran International airport in Las Vegas, ignore the shiny slot machines. Yes, slot machines at an airport are highly unusual. But you’ve got things to do! Head to the baggage claim area, pick up a bag (YOUR bag, only if you checked one), look for the signs for Ground Transportation and get yourself on the shuttle to the McCarran Rent-A-Car Center! All the car rental companies are located about three miles away at the Rent-A-Car Center, there is no avoiding the shuttle if you are renting a car at the Las Vegas airport. If you are arriving on a weekend, you will probably see a pretty sizable line at the Thrifty Car Rental counter, along with all the other car rental counters. That is why we highly recommend joining the Thrifty Rewards Program called “Blue Chip Rewards” before you go. Then when you get to the airport, you can skip the line! Or at least get in a much shorter line of Blue Chip members. You may be thinking, why on earth would I need a car in Las Vegas? First off, cruising The Strip can be kind of fun. Secondly, you may want to take a short trip over to the Hoover Dam or Lake Mead or Red Rocks, and not be at the mercy of the strict schedules of the Las Vegas tour companies. Most of them leave early. So, so early. If you are staying longer than a weekend, you may even want to check out the Grand Canyon! It’s totally not overrated!